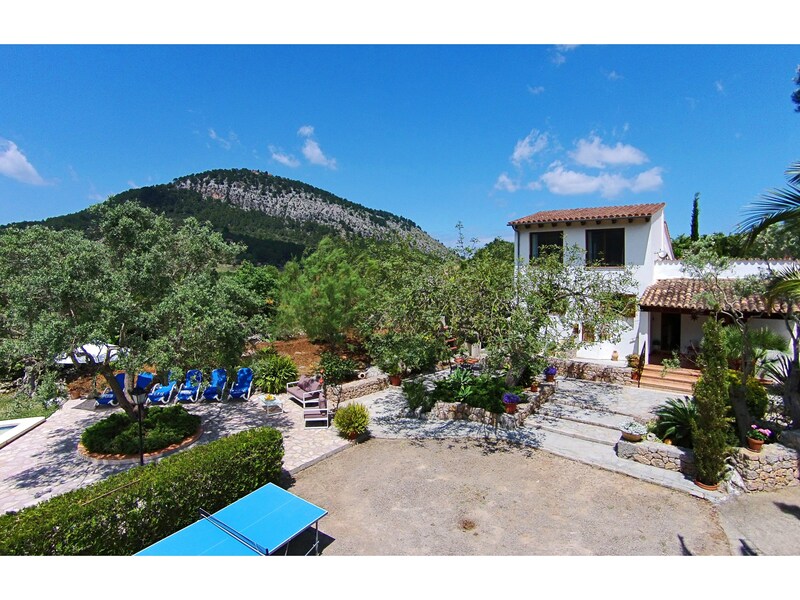 3 Bedroom, 3 Bathroom Villa with Mountain View and a Private Swimming Pool , Air Conditioning, WiFi, Table Tennis, Satellite TV, near Golf, Sleeps a maximum of 6 people. 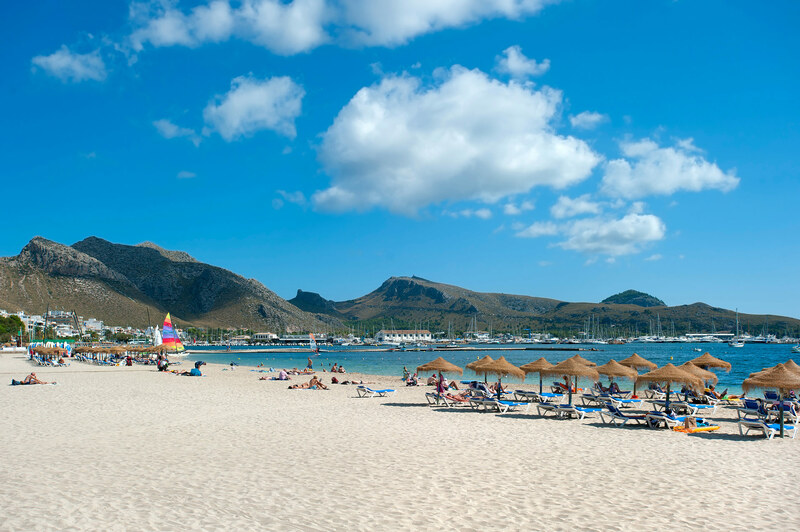 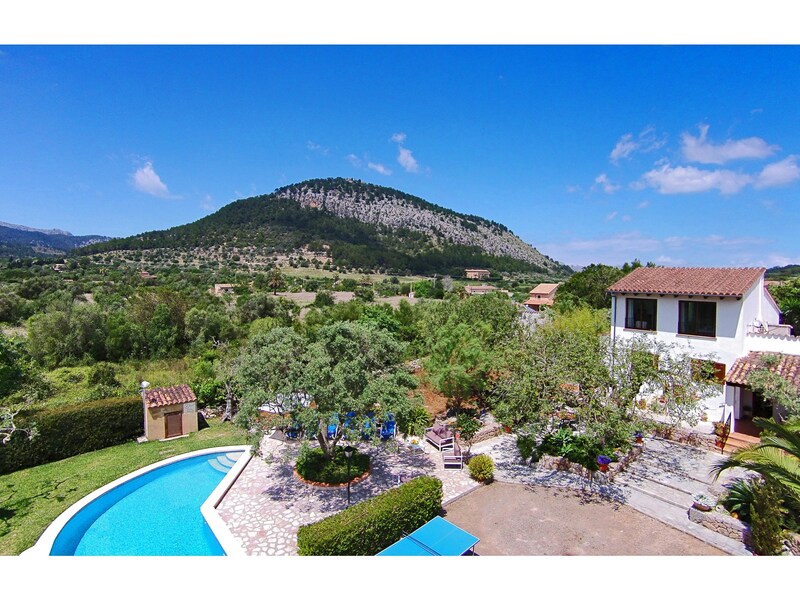 Looking for an exceptional family holiday in a peaceful location on the lovely island of Mallorca, yet within easy reach of a lively town? 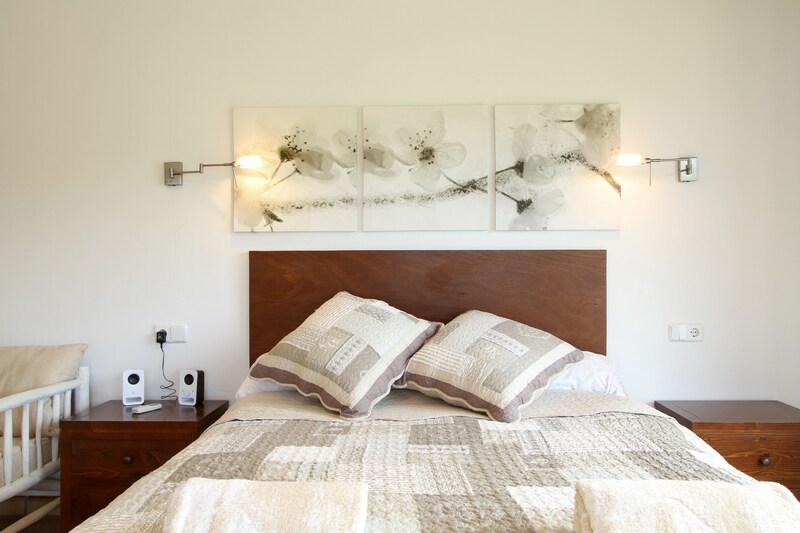 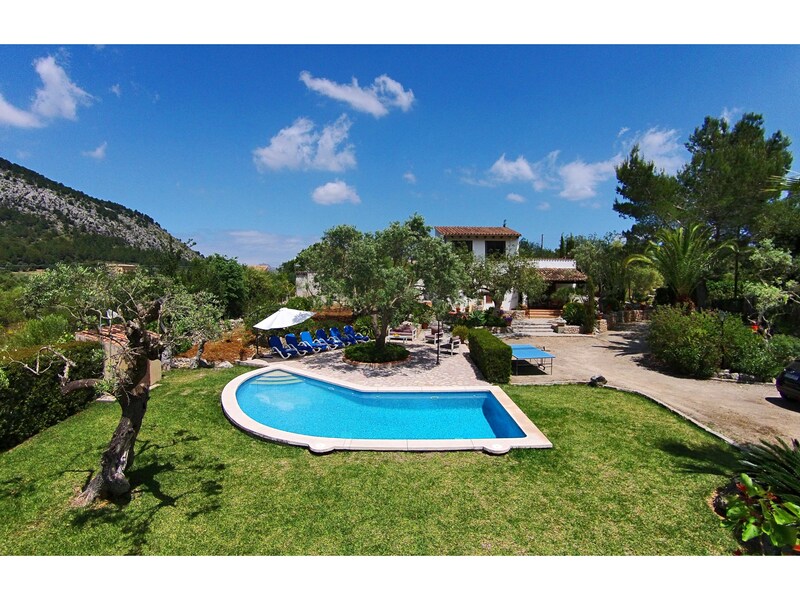 Then look no further than the fabulous holiday villa that is Cal Perdiu Vell. 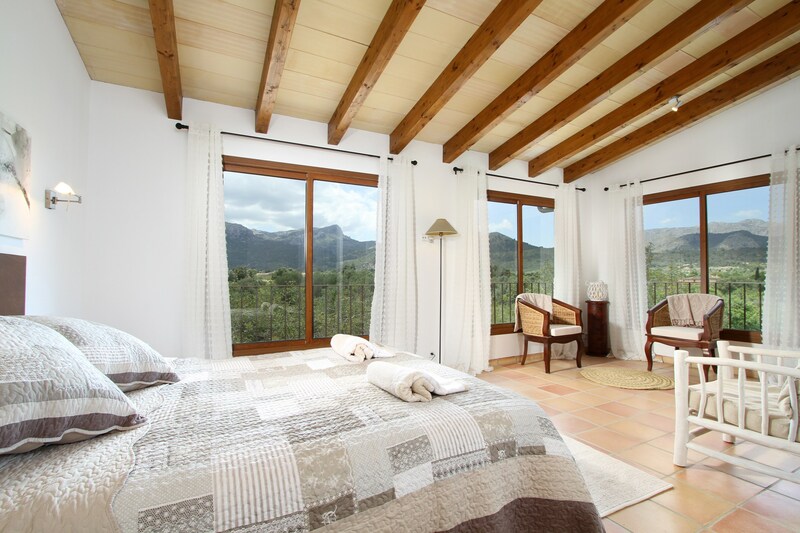 Cal Perdiu Vell sits comfortably in a picturesque sheltered valley just a short distance from the cultured and historic town of Pollensa. 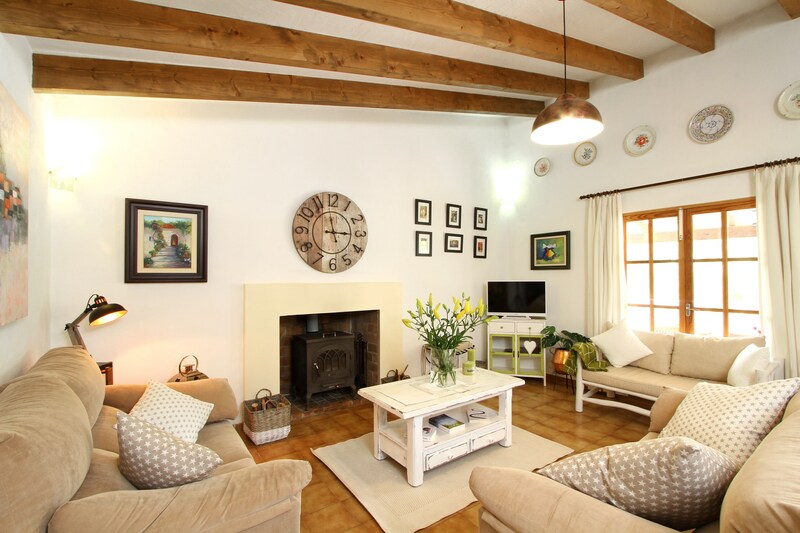 As soon as you enter the estate via the drive (ample private parking) you can feel the history of this once rural farmhouse, now thoroughly modernised and extended. 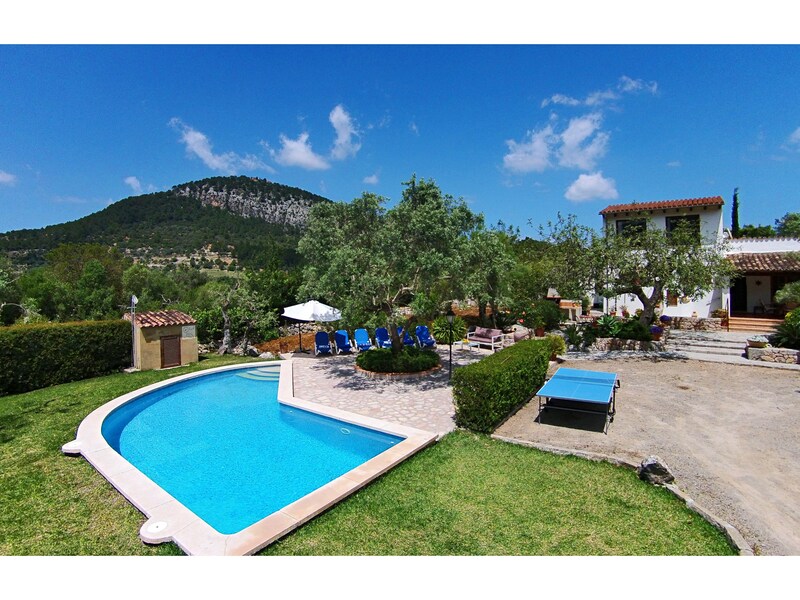 Terracotta roof tiles, whitewashed walls, stone terraces, beautifully laid out garden, barbecue area, swimming pool… you`ve got it all here, and in spades! 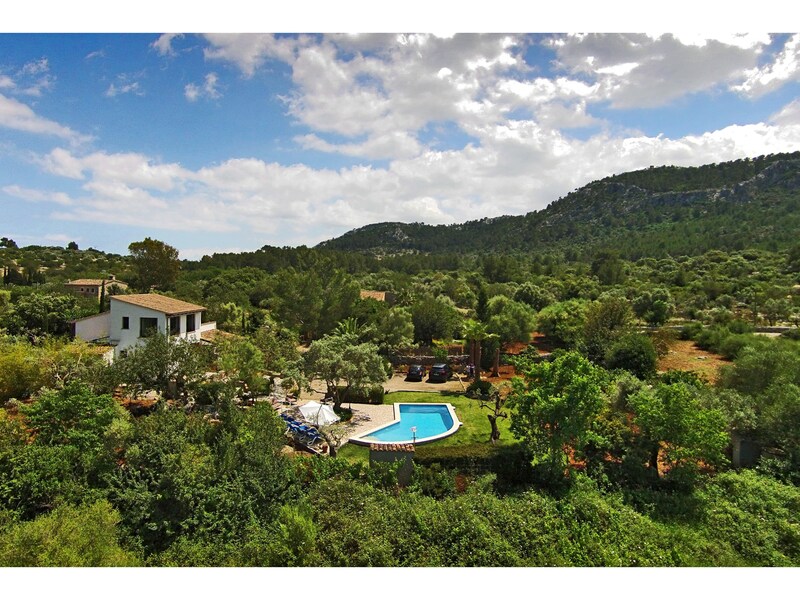 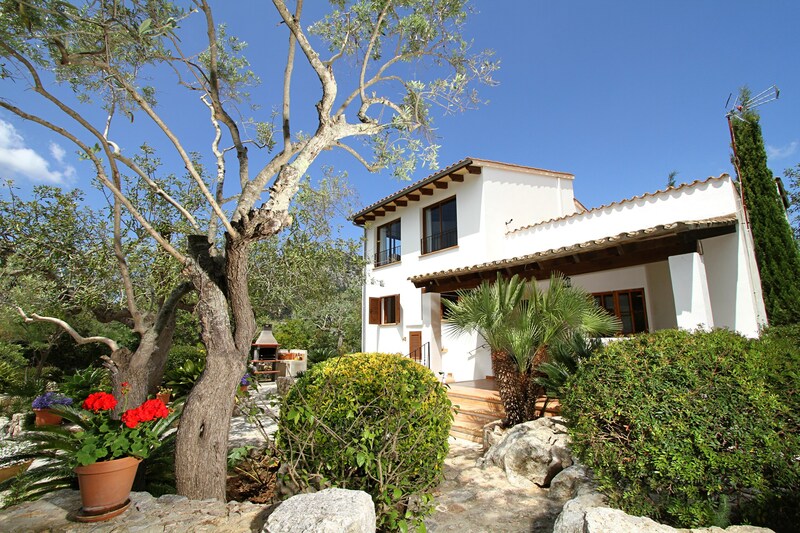 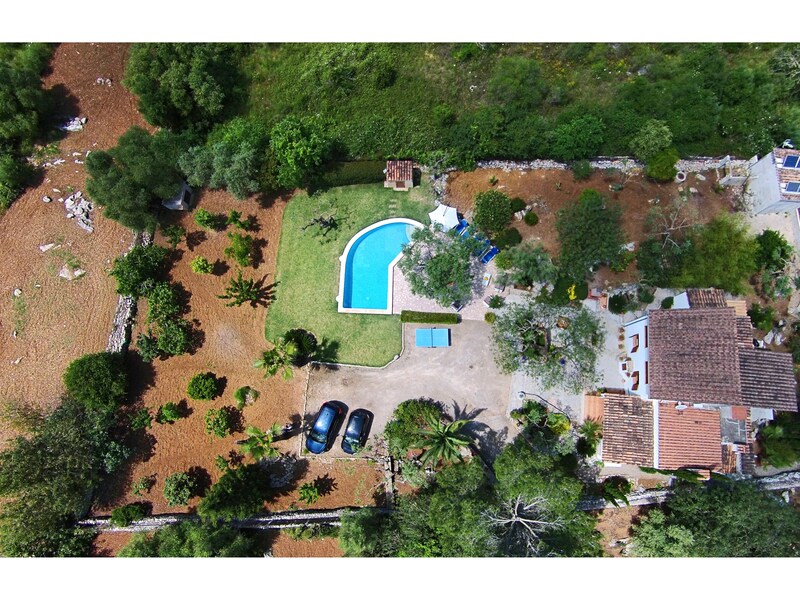 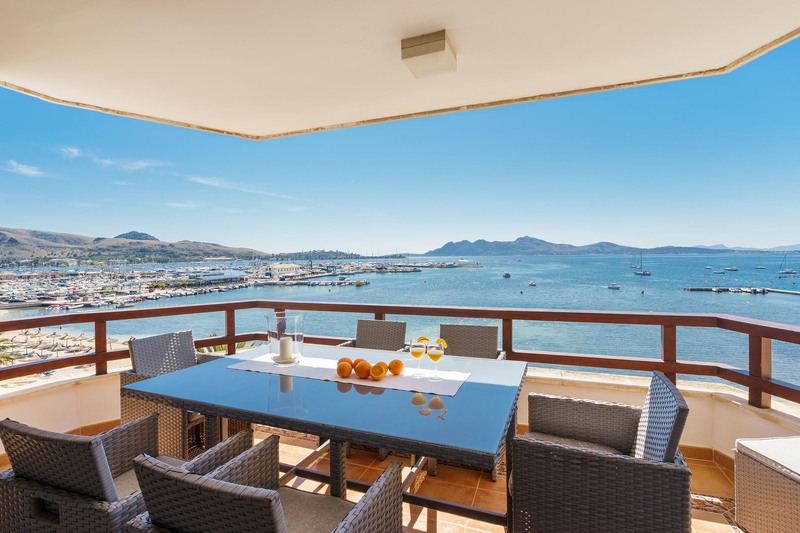 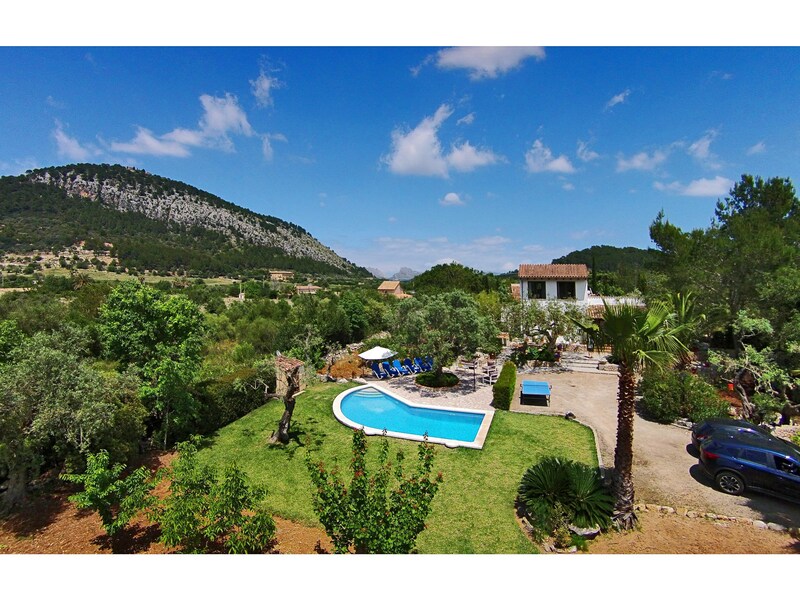 The property is surrounded by the pretty north Mallorcan countryside. 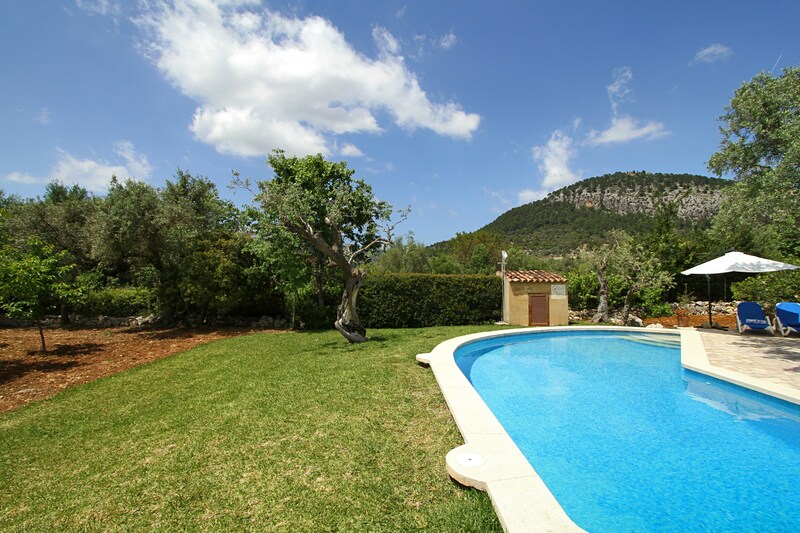 Nestling peacefully in a large, pretty garden with lush lawns, ancient olive trees and a private swimming pool, it’s the perfect place to escape from the world and enjoy a relaxing holiday in the Mallorcan sun. 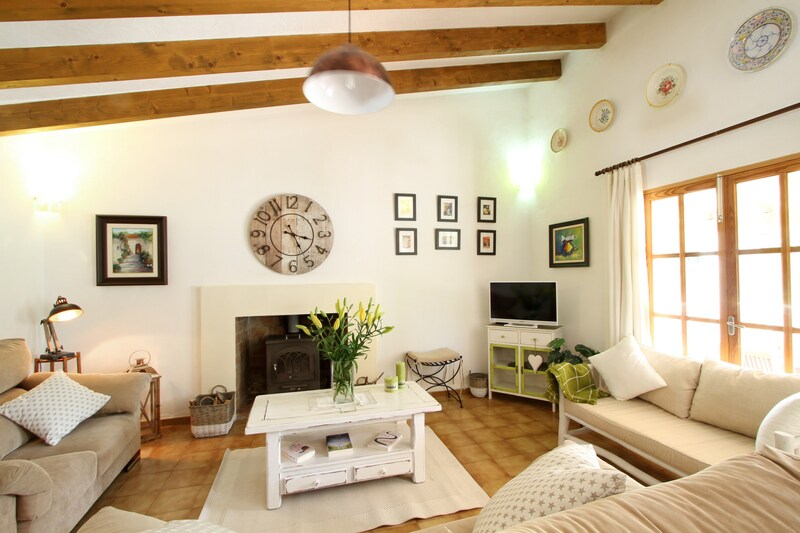 The downstairs living area is a pleasant, tranquil place with large cosy sofas to relax on and catch up on your favourite programmes on the satellite TV after a busy day exploring the island. 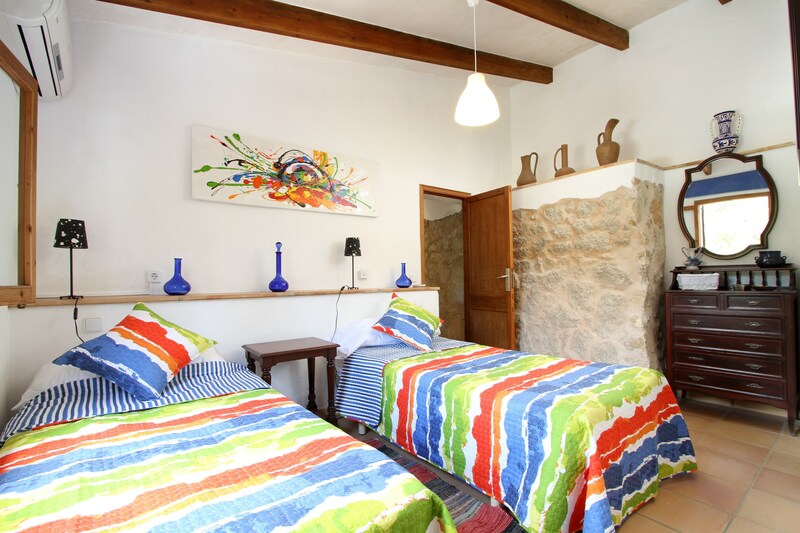 All the traditional touches are here: terracotta floor tiles, wooden roof beams, thick stone walls, traditional fireplace as well as some interesting antiques dotted around the place. 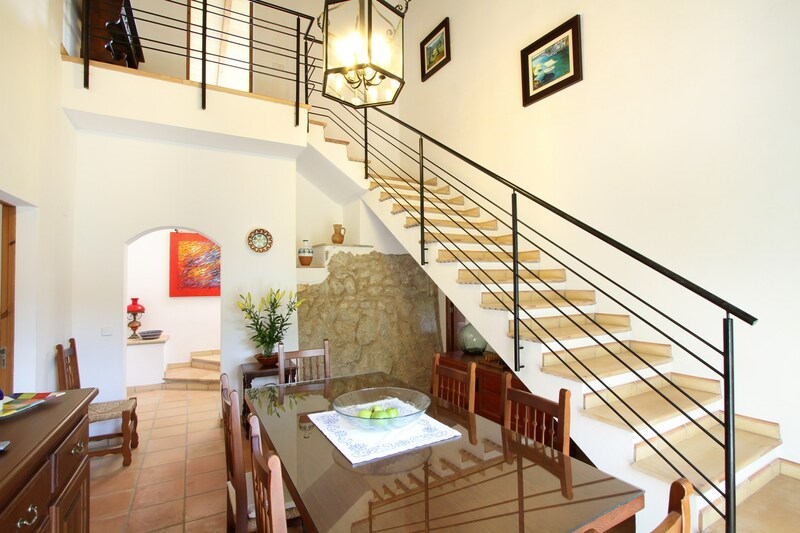 The attractive, understated dining room is a joy with a large dining table and interesting rural Mallorcan artefacts. 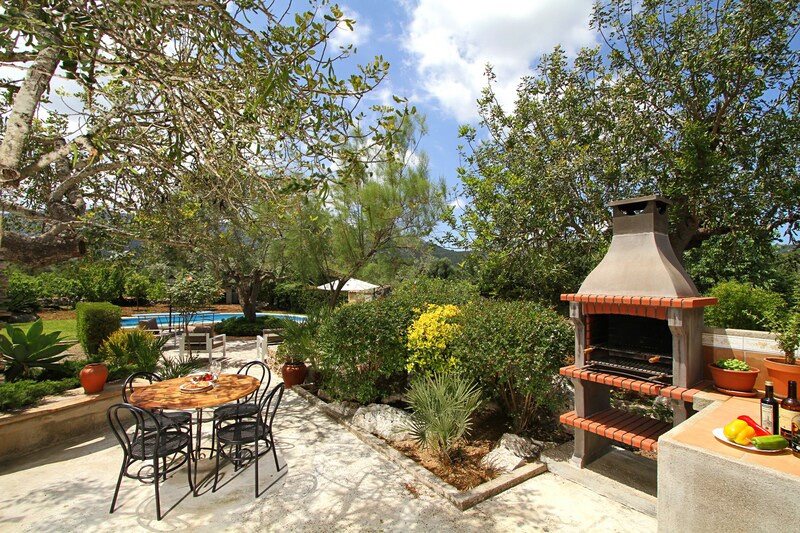 The perfect place for an evening meal with family and friends. 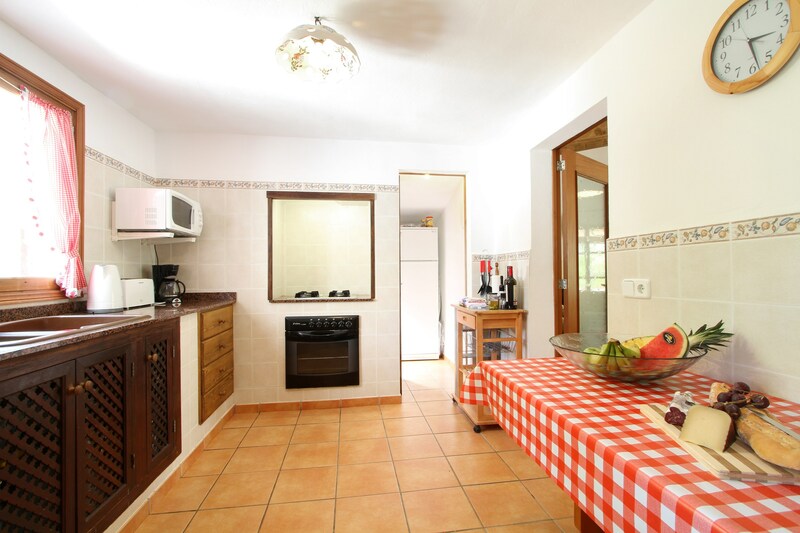 The fitted kitchen is lovely too. 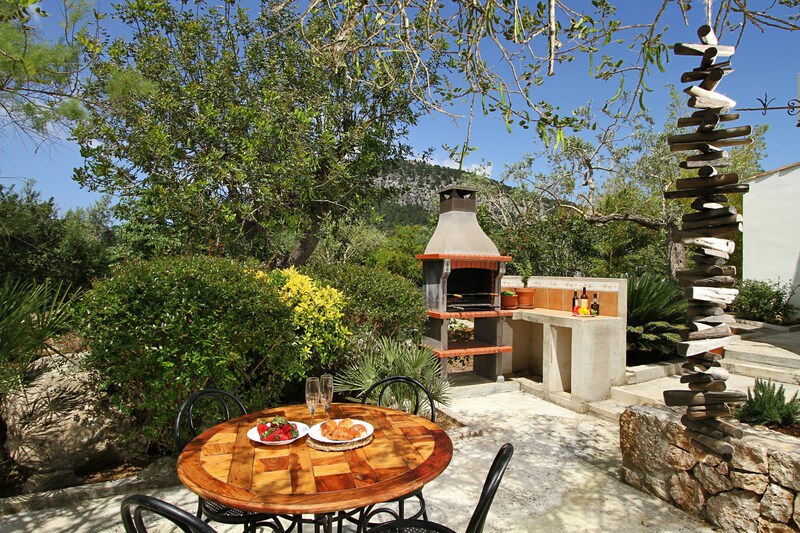 Still retaining an `old world` feel but with all the mod cons you need to cook up a treat using fresh produce from the local markets. 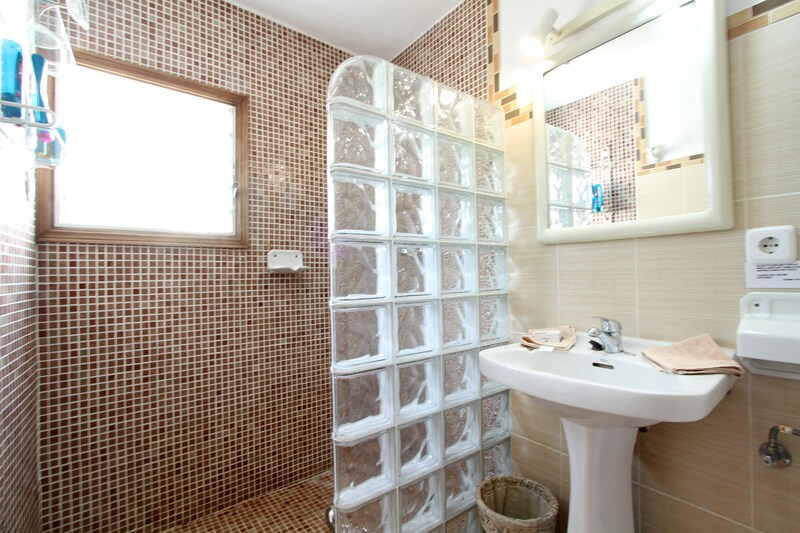 There is a dishwasher here as well as a substantial larder containing a safe and washing machine. 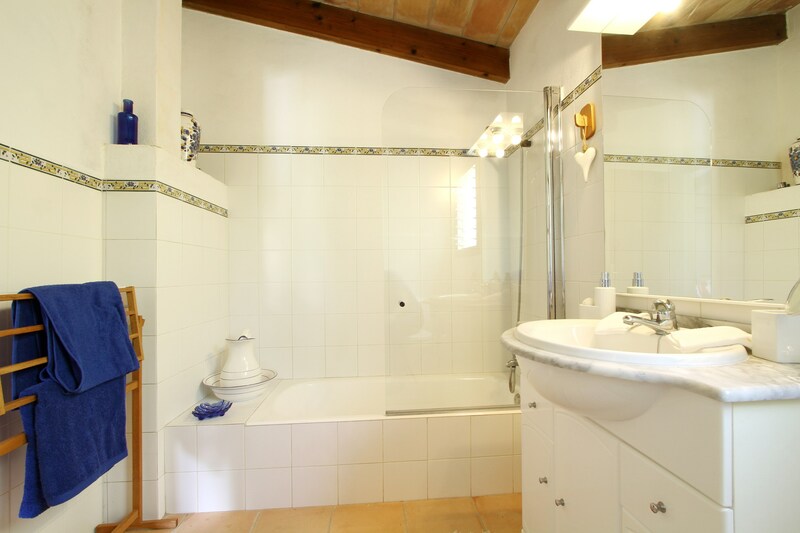 You`ll find two bedrooms on this level, one double with views out to the garden and a neighbouring bathroom, and one twin, with it`s own en suite. 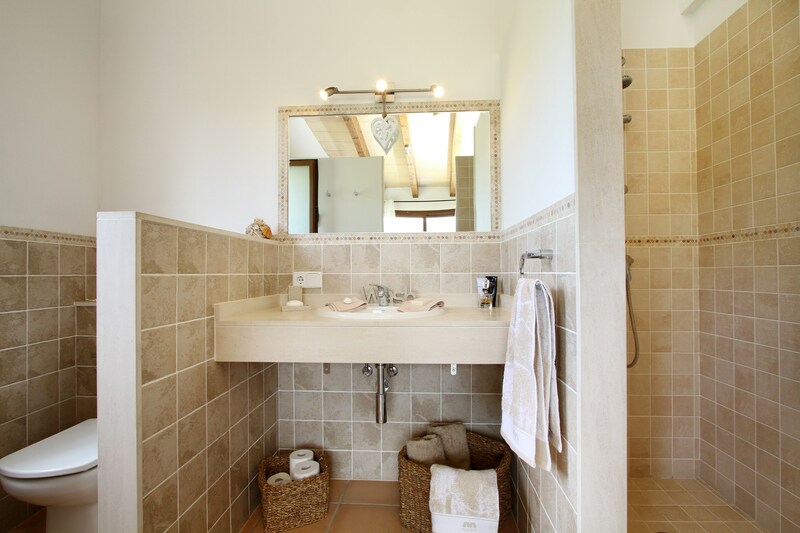 Climb the traditional stone staircase and you`ll come across the fabulous master en suite bedroom which takes up the whole of the top floor. 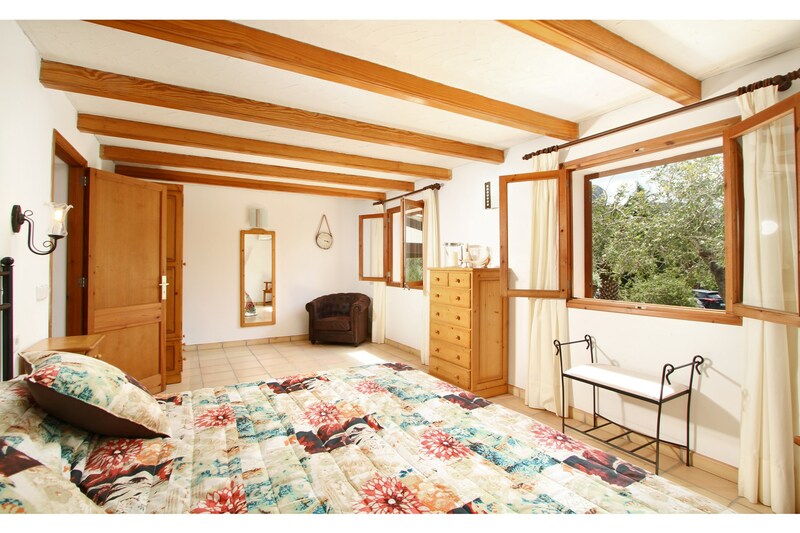 It`s absolutely gorgeous, particularly when the soft Mediterranean light streams in through the room-sized windows. 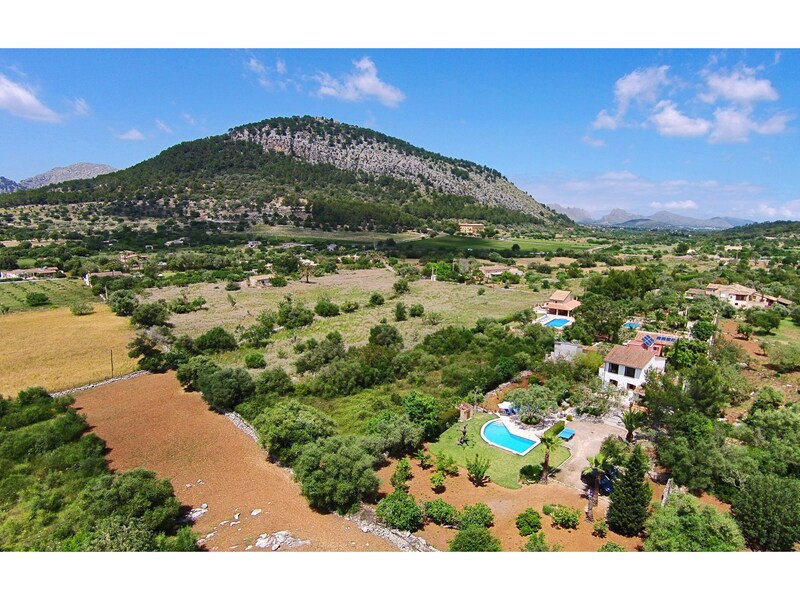 Suffice it to say that the views towards the Tramuntana Mountains are absolutely breathtaking. 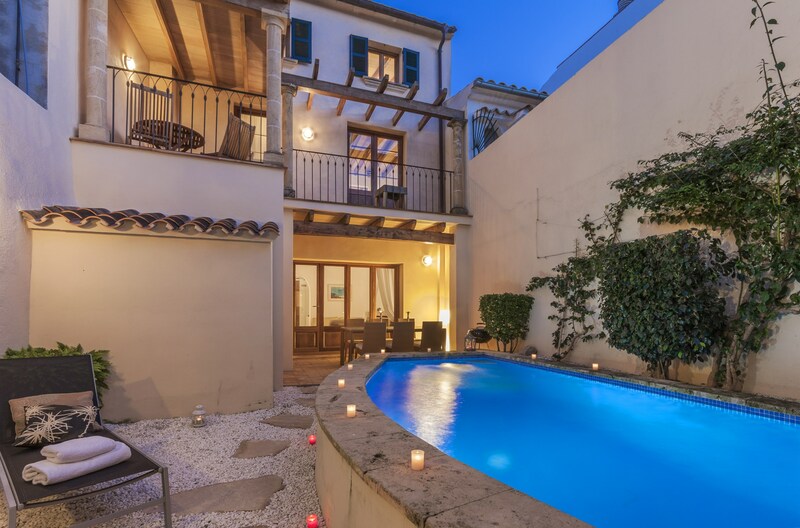 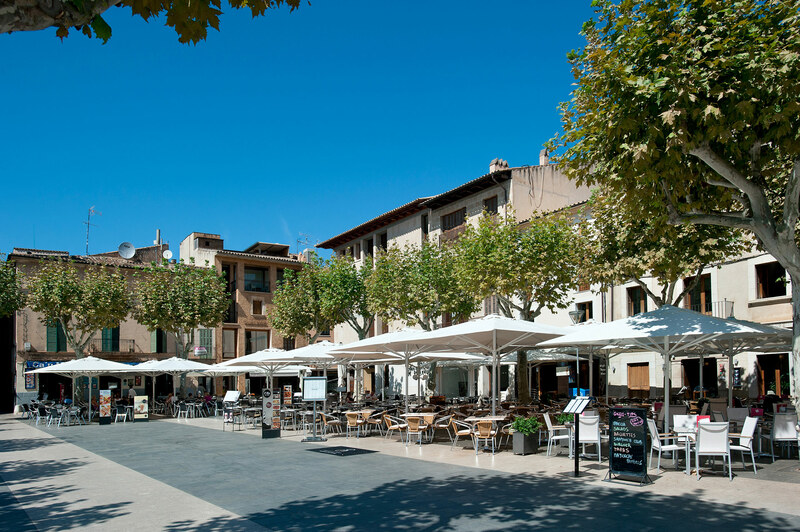 The exterior of Cal Perdiu Vell represents the very best that a Mallorcan holiday villa has to offer. 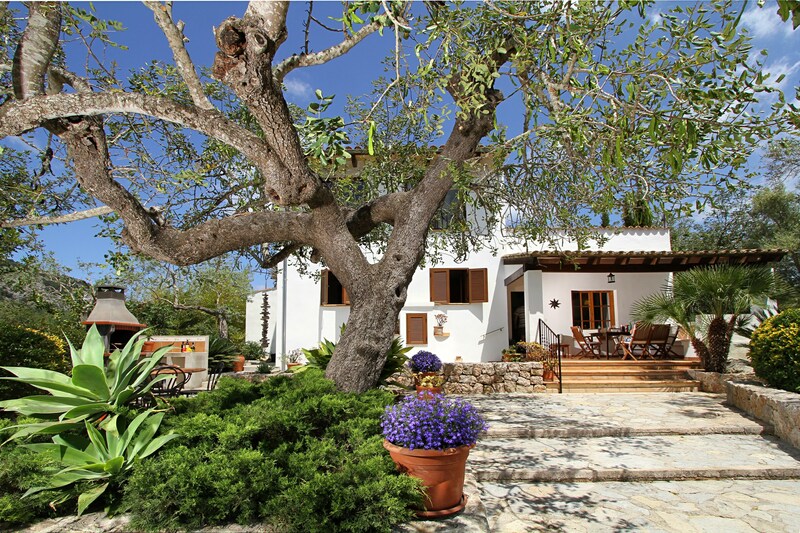 Ancient olive trees give one a sense of rustic timelessness (as well as welcome shade) and the spacious garden is prettiness personified. 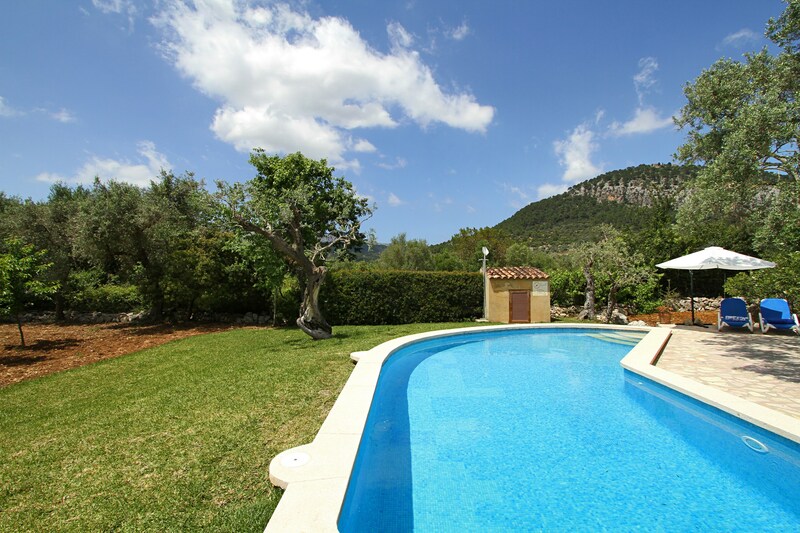 The swimming pool has a stepped entrance for easy access. 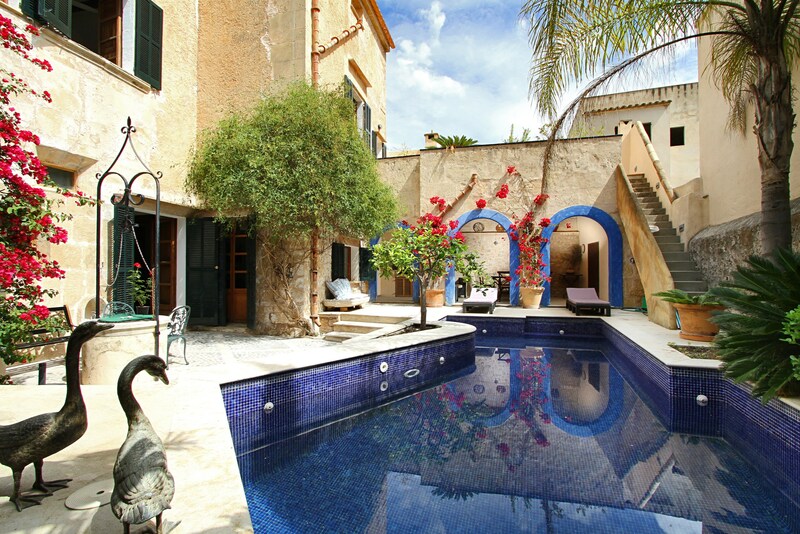 It`s so inviting too, particularly in the hot Mediterranean sun. 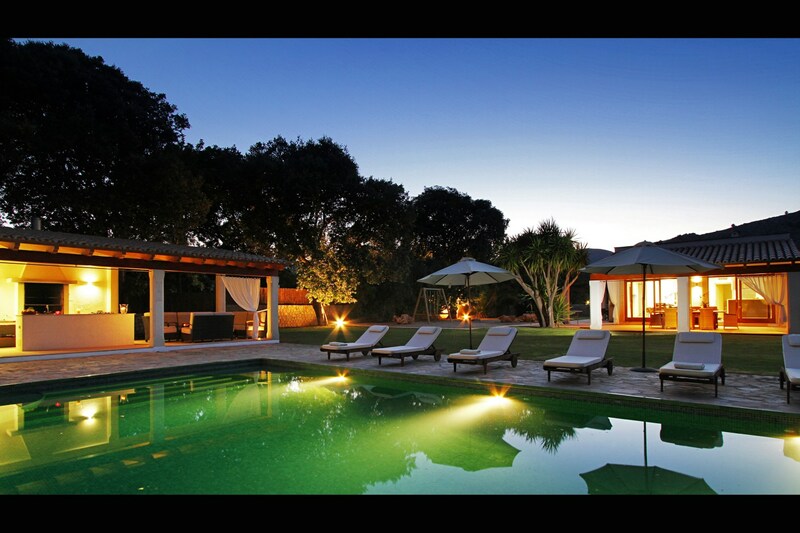 You can recline on the loungers with a large parasol in place to provide shade. 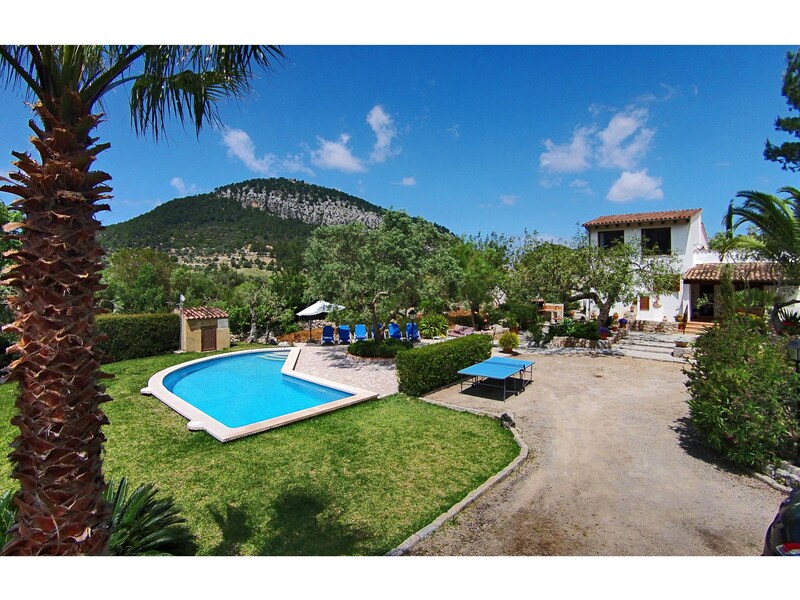 And the kids will no doubt love playing outdoor table tennis table! 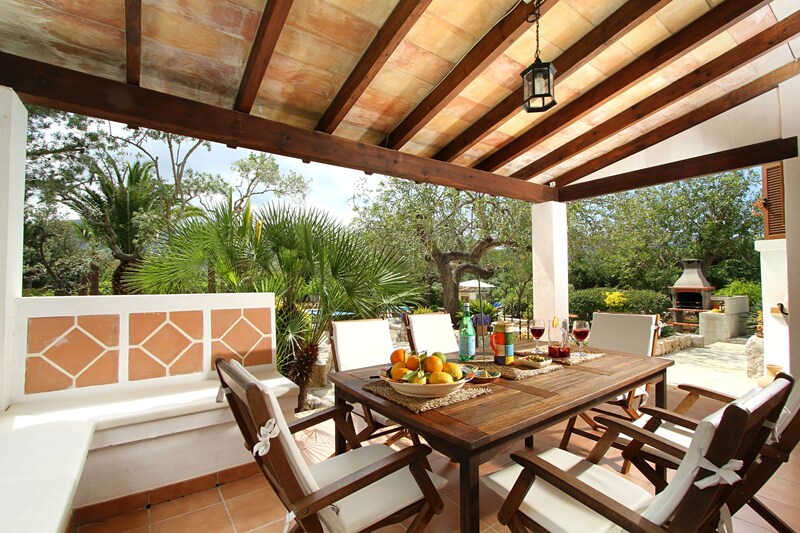 There is a superb outdoor dining area situated beneath an attractive veranda, the perfect place to enjoy an al fresco meal in the shade.